Woloch, Isser. 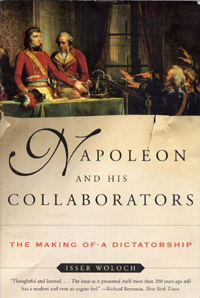 Napoleon and His Collaborators: The Making of a Dictatorship New York : Norton, 2001. 352 p. ISBN# 0393050092. $29.95. Hardcover. As its title states, Napoleon and His Collaborators is an attempt to assess the men who made the Napoleonic regime possible. Woloch seeks to explain the success of the Consulate and Empire in attracting a diverse group of Frenchmen to Napoleon's banner. Woloch focuses much of his attention on a few "figures of particular interest": Boulay de la Meurthe, Théophile Berlier, Antione Thibadeau, and Jean-Jacques-Régis Cambacérès. Woloch begins with an examination of the events of the Brumaire coup and the men who selected General Bonaparte as the man to provide the armed force necessary for the plot. General Bonaparte was chosen because he was considered the moderate choice when compared with the other possible choices who were either associated with the Jacobins or the Royalists. The coup was an effort to correct the mistakes of the Directory and to finally create a stable Republican government for France, averting civil war. The coup itself was a pseudo-legal exercise, which almost failed when Napoleon received an angry reception at the Council of Elders where the plotters attempted to find legal approval for the coup. The conspirators had to resort to force, with Napoleon's brother Lucien leading a contingent of grenadiers into the Council to save Napoleon. The Constitution of 1799 was in large part the creation of Emmanuel Sieyès, and would provide the legal and political framework Napoleon would work under. Napoleon insisted on taking the chief executive position in the new Constitution, the First Consul, and his co-conspirators were in no position to deny the man of the hour. One reason for Napoleon's success in the early years of the Consulate was his success in incorporating Frenchmen from different political factions. Napoleon attempted to heal the schism caused by the Fructidor Coup of 1797. Former Jacobins and Royalists were both brought into the Consulate. The extension of amnesty to the émigrés that had fled the Revolution also served to reconcile many to the new government. However, extremists on the right and left were excluded from the Consulate. According to Woloch the story of the rest of the Napoleonic period is that of an increasing erosion of the Constitution of the Year VIII and the Revolutionary ideals behind it. The first major event in this process was the attempted assassination of Napoleon while his coach passed the Rue Nicaise on December 24, 1800. Napoleon immediately blamed the Jacobins though Minister of Police Joseph Fouché discovered that the Royalists were the more likely culprits. A genuine anger was aroused among the elites by the perceived Jacobin threat. Napoleon brought a motion before the Senate whether the government had the authority to pursue "anarchists" that had been deemed guilty. Most shared Napoleon's determination to suppress the Neo-Jacobins regardless of their actual guilt in the Rue Nicaise incident. According to Woloch, the Consulate became a "forced merger" where the First Consul was striking down the institutions and people that could oppose him. Napoleon proceeded on several paths to eliminate opposition. Political clubs and the salons were closed. In the Senate, after Napoleon's elevation to Consul for Life the law was changed so that the First Consul chose the three candidates for each seat. Furthermore, Napoleon was able to appoint up to 40 additional senators directly. The Tribunate, one of the few institutions where opposition to the First Consul's plans could be expressed was allowed to atrophy and die out by 1807. Meanwhile, the Consulate was being transformed into the Empire. For Napoleon's family and some of his more zealous supporters, a hereditary regime was the next logical step. After an effort to be proclaimed Consul for Life failed in the Senate, Napoleon instead turned to a national plebiscite. The 1802 plebiscite revealed that there was genuine broad support for the new government, as well as confirming Napoleon as Consul for Life. The transition to Empire generated surprisingly little opposition within the government. Even formerly ardent republicans such as Berlier accepted the return to a hereditary monarchy, seeing it as an inevitable step after the Life Consulship. The creation of a hereditary nobility by the Senate provided further glue for the regime, giving many incentives to join or continue their support for the Empire. Woloch spends an entire chapter on the individual he calls "the second most important man in Napoleonic France," Jean-Jacques Cambacérès. Cambacérès did everything from managing the Senate to running the Empire while Napoleon was on campaign. Whether as Second Consul or Arch-Chancellor, Cambacérès proved adept at finding new ways to circumvent laws restricting the power of the Napoleonic state. Cambacérès also became the man most associated by Frenchmen with conscription. In the process he became one of the richest men in the Empire, having an annual income of over 800,000 francs in 1813. His mansion served as a second court, hosting lavish receptions and dinners. Woloch does have praise for Napoleon's administrative abilities, and his ability to motivate his subordinates. Napoleon rewarded those loyal to him with titles, land, and other forms of financial compensation. The formation of the Napoleonic nobility in 1808 held out the possibility of passing on one's title to one's son. Napoleon went to great effort to create institutions to buttress his regime. The Corps of Auditeurs, in the Council of State was one such institution, choosing its members from the aristocrats from the ancien regime. They were to be molded into loyalists to the Empire. Candidates were screened for merit, since it was expected that an auditeur might move into the prefectures or the ministries. Napoleon believed that legislation should be written by those with a hand in the implementation of policy. Debates in the Council were encouraged to be uninhibited by Napoleon in the early years, though as time went on, Napoleon cut short discussions and silenced dissenting opinions in the Council. Napoleon would also turn to Conseils d'Administration to deal with specific areas of administration. (War, Interior, Finance, etc.) Woloch also refers to Conseil Prives used to consider issues of clemency, and when an important law was coming before the Senate. Woloch uses the trial of General Dupont in 1812 as the example of Napoleon rejecting the advice of a Conseil Prive to impose a harsher sentence. Woloch is harshest in his condemnation of Napoleon when discussing what he calls "the erosion of liberty." Censorship and Preventive Detention were two of the more important infringements of individual liberties. Preventive Detention of prisoners, political and criminal, became a major method used by Justice Ministry, to deal with Vendeans, seditious priests, vagabonds, as well as ordinary criminals that had been set free by sympathetic juries. Such prisoners were held indefinitely without trial as Prisonniers d'État. A Senatorial commission reviewed the Prisonniers d'État starting in 1804, releasing some of the non-political prisoners. Realizing that the Prisonniers d'État were becoming a problem, Napoleon instituted an annual review of all prisoners in preventive detention by a special Conseil Prive, starting in 1809. Censorship proved to be an area of much debate within the French government. Liberals fought for voluntary censorship by publishers rather than imposing censorship from above. Hard-liners from the Comte de Ségur to Cambacérès favored strict government censorship. With Napoleon's support, the hard-liners eventually triumphed, imposing a system of censors and book inspectors in 1810. Woloch asks why opposition within the government to Napoleon's increasing infringement of the ideals of the Revolution remained ineffective. He makes an analogy between Napoleon's subordinates and the liberals of Robert MacNamara's Defense Department during the Vietnam War, both which he says would have been more effective in opposing the government if they had publicly resigned to express their opposition to their government's policies. They remained loyal for status or money, or due to personal loyalty to Napoleon. (Interestingly, Woloch does not mention nationalism as a possible motive, though he does refer to a sense of duty.) Woloch holds Foreign Minister Talleyrand up as an example of his suggested means of opposition— resigning when he was convinced that Napoleon had overstepped his bounds. Why Woloch would chose Talleyrand as his example is puzzling, since Talleyrand was one of the most sycophantic of Napoleon's advisers. In addition, Talleyrand's resignation certainly did not prove effective in restraining Napoleon's ambitions in the least. Cambacérès provides the better example— using his personal relationship with Napoleon to ameliorate excesses from within the system. In the desperate circumstances after the Battle of Leipzig, Napoleon was forced to return some power to the Corps Législatif in order to resolve his financial difficulties and to push through another Conscription Law. But when a critical report on Napoleon's negotiations with the Allies emerged from the Corps, the Emperor dismissed the legislature. With the Allied armies marching into Paris in 1814, the Senate voted to dethrone Napoleon on April 2 and to restore the Bourbons, including many of the men that had ascended under Napoleon. The Bourbons pledged to leave Napoleon's former officials alone, but before long many were purged from the government and the legislature. During the Hundred Days, Napoleon's attempt to reinvent himself as a liberal emperor received some support from his former collaborators. Those who did support Napoleon faced retirement or exile during the Second Restoration. Napoleon and His Collaborators does give a revealing portrait of Napoleon's "Iron Men." I would have liked to see more on the men who directed Napoleon's foreign policy, and a few examples of men from the lower echelons of the Napoleonic bureaucracy. Hopefully, future works will expand on the solid background that Napoleon and His Collaborators provides, to further our knowledge of the inner architecture of Napoleonic France and the men who made it possible.